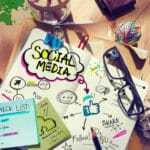 The importance of social media marketing in real estate cannot be overstated. Properly used, social media can help real estate agents overcome one of the most challenging issues they face: the need to keep clients interested and engaged for the excessively long lead times that exist in real estate. While most home buyers actively search for an average of ten weeks before finding the residence of their dreams, the complete path to a home purchase can be years in the making. Social media gives you a convenient way to stay in touch with clients and maintain a top of mind status without wearing out your welcome by creating “relationship fatigue.” Social media marketing can vastly extend your real estate marketing reach. Every time your posts and Tweets appear in one of your follower’s timelines, you’re not just connecting with that individual; you’re getting your message out to his or her entire network of followers and contacts. That’s a lot of potential home buyers and sellers you just reached without having to invest any additional effort! While social marketing strategies can be highly effective tools for real estate agents, it does require patience and dedication to nurture relationships with potential clients all the way through the purchase journey. At For Sale Marketing, we’ve got social media marketing solutions that can help improve your results no matter what stage your social marketing strategies have reached. If you’re a social media enthusiast who loves to send out posts and Tweets throughout the day, For Sale Marketing may be able help you explore other social strategies that can help you grow your real estate brand, or provide you with additional resources, such as video marketing, to make your existing social strategies more effective. If you have your hands full keeping your real estate clients happy and don’t want to spend the time and effort on social media, For Sale Marketing can take care of your real estate social marketing strategies for you. We’ll take charge of some or every step of your social marketing strategies, whatever you prefer. Take a look to see what our dedicated social marketers can do for you. Each of the various social media platforms has its own strengths to allow you to develop and nurture different aspects of your relationships with real estate clients. Facebook and Twitter provide a strongly social arena to grow the personal side of your client relationship. LinkedIn and Google+ address the more professional end of social media, creating a forum to let your real estate acumen show through. We’ll assess your real estate brand to determine which social marketing strategies best reflect the unique skills and qualities you bring to the real estate experience. Once you settle on 3 or 4 strategies, For Sale Marketing will set up a social sharing page for each platform, and then link them to your real estate website. We’ll send out 6-8 real estate-themed Tweets per day. We’ll arrange a schedule of tweets to post throughout the day, but keep an eye open for the chance to utilize Twitter’s micro-blogging format to add real time real estate posts of relevance. We’ll come up with intriguing Tweets related to real estate that are certain to interest your followers: marketing statistics, links to short URLs on mortgage information, housing trends, etc. In addition to posting a mix of unique valuable content and listings, we’ll re-Tweet relevant content from other real estate industry sources, using videos, photos, and hashtags to heighten engagement with real estate clients in your community. Google+ offers a variety of ways to build and nurture contacts into valuable real estate leads. We’ll put up regular posts on real estate matters; as we grow your list of followers, we’ll categorize them into interest groups such as new home buyers, sellers, DIY-ers interested in older homes and renovations, etc. using Circles. We’ll then create and share information targeted for each Circle based on that group’s particular interests. Google+ Hangouts are a great way to interact with your followers; we can help you take advantage of the real-time video chat rooms to connect with clients through discussions on real estate marketing tips, home improvement DIY projects, and other real estate related issues. We can even stream your meeting to your YouTube real estate channel using Hangouts on Air to maximize your marketing impact. Social media has turned into a “pay-to-play” arena where the most effective real estate marketers are the ones who invest in paid advertisements. Our social media marketers will extend your marketing reach using Promoted Posts and Sponsored Stories with Facebook Ads, carefully targeting real estate clients by interests, age, gender, and location. We’ll create effective Twitter Ads using localized real estate keywords and schedule them to run at the specific times during the day that will attract the most interest. For Sale Marketing’s social media marketers can set up and implement plans like these for the full list of real estate marketing strategies. We’ll create a dynamic presence for you on whichever social marketing strategies best suit your real estate brand, whether that means setting up galleries of images on Pinterest or developing a video library to feature on a dedicated YouTube channel. Talk to our marketing professionals to find out all the ways that For Sale Marketing can help you develop your real estate social strategies. We’ll establish a robust social marketing strategy to help you generate more online real estate leads and establish you as the go-to professional clients will seek out for all their real estate needs.